Arrive in Lisbon, Portugal’s capital city, and transfer to your hotel. The remainder of the day and evening is free to explore on your own. One of Europe’s most beautiful cities, Lisbon sprawls across several hills along the Tagus River. See Belem Tower, a fortified 4-story tower made of limestone, and visit the Late Gothic Jerónimos Monastery, the burial place of many Portuguese kings and heroes. The rest of the afternoon is free for you to explore the city’s other top sights, such as the Castle of São Jorge or the Santa Justa Elevator that overlooks the castle, river and Rossio Square. Enjoy an excursion to Serra de Sintra, former home of the Portuguese royal family, one of the most picturesque mountain villages in Portugal and a source of inspiration for generations of poets. You will have a guided tour of the Pena National Palace, a fairy tale castle from Portugal’s Romantic period, situated high up on a rocky peak. Today you will leave Lisbon behind and will take the TGV high-speed train to Porto to board your ship. This evening, meet your fellow travelers at the Welcome Dinner. The ship moors overnight in Porto. Your sightseeing tour of Porto reveals 16th-century arcaded buildings, Baroque churches and the magnificent iron bridge built by French engineer Gustave Eiffel. You will also have a chance to see the elegant residential section along the Atlantic coast. This afternoon, you can explore on your own or take part in a guided hiking tour of Porto where you will explore the old harbor quarter, passing through the medieval streets of Porto, and cross the Dom Luis Bridge. The ship moors overnight in Porto. An excursion to Guimarães brings you to one of the most historic towns in Portugal and a UNESCO World Heritage Site. Enjoy some scenic cruising through the Douro Valley on your way to Entre-os-Rios. This evening you will journey to a near by winery for a delicious Portuguese dinner off ship at Casa de Vila Verde. The ship moors in Entre-os-Rios overnight. This morning take an excursion to Quinta de Avelada, a historic family-owned wine estate near the city of Penafiel. Upon arrival, you’ll enjoy a tour of the winery followed by a delicious wine and cheese tasting. Afterwards you will have some free time to explore the grounds and admire the estate’s famous gardens. When the ship arrives in Régua, you’ll visit the Wine Museum. Today, you will have an excursion to ancient and picturesque Lamego, home to one of the most important pilgrimage sites in Portugal, the Nossa Senhora dos Remédios (Sanctuary of Our Lady of Remedies). Other attractions include a Gothic cathedral, a museum, and charming cafés. This afternoon, enjoy the wild, rugged scenery as your ship cruises through the dramatic gorges of the Douro river valley. Alternatively, you may wish to visit Quinta da Pacheca where you will enjoy breathtaking views over the Douro River and picnic in a terraced vineyard. Later, you’ll join a wine tasting at Quinta Avessada. After breakfast, take an excursion to the Baroque palace and gardens known as the Palacio de Mateus, located in the beautiful region of Trás-os-Montes near the city of Vila Real. Afterwards, you will have a special lunch and wine tasting at Quinta de Roeda, Later this afternoon, you will sample the region’s famed port wine at Quinta do Seixo. Take in the stunning views along the valley as you cruise from Pinhão to Barca d’Alva. In the afternoon you will visit Figueira de Castelo Rodrigo, a fortified 16th-century village nestled high on a hilltop with many steep, narrow streets. Be sure to stop in the market square to admire the Chafariz dos Pretos, a striking fountain decorated with black faces. The ship arrives in Vega Terrón later this evening, where it will moor overnight. 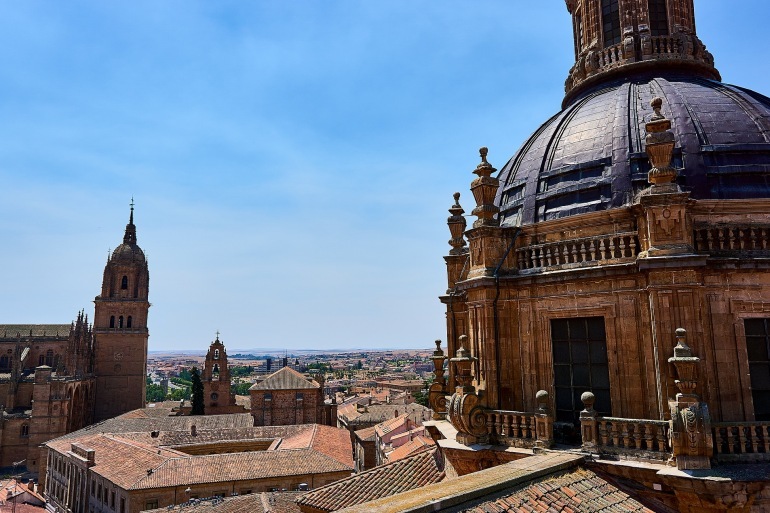 You will disembark your ship and head off for a full-day tour of Salamanca, a UNESCO World Heritage Site located at the center of Spain’s Castilla y León region. Your guided city tour includes the university buildings, the 12th-century Romanesque church of San Martin, the House of Shells, and also some free time to explore the city on your own. Later, you will be transferred to Madrid and check in to your hotel. Today you will have a guided tour of Madrid, the capital and largest city in Spain. Known for its many historic districts as well as its modern infrastructure, the city’s top landmarks include the elaborate Royal Palace, Buen Retiro Park, Plaza Mayor, and world-renowned art galleries such as the Prado Museum and Centro de Arte Reina Sofia. Enjoy an unforgettable excursion to the walled city of Toledo, a UNESCO World Heritage Site and ancient capital of Spain. Populated since pre-Roman times, the city’s landmarks include the Alcázar, Cathedral of Toledo and the El Greco Museum. Single Supplement for Land: $900 per person. Bedding: Please select bedding configuration at the time of booking. Option A: Two twin beds Option B: One large bed (larger than queen size).